DIY Victorian Faux Leather Steampunk Gears and Parchment Paper Digital Printable Wedding Invitation & RSVP. A great stylized and one of a kind wedding invitation suite for your Theme Wedding or Offbeat Wedding! Intricately designed with a distressed parchment paper look with gears overlayed, faux leather flaps, grommets, screws, and other lil metal bits adorn the edges. This is a digital file listing. No shipping required. *Customization of fonts and sizes can be done on request. Extra charge of $10.00 for excessive overall design changes. ***Please note that this is for a digital copy of the design only, and does not include paper or printing. **** This is DoubleAction Design (Julie Farrell) original design and for your personal(non commercial) use only. You are not allowed to reproduce this image outside of your personal use, nor put on any other websites for sale, products for sale etc. 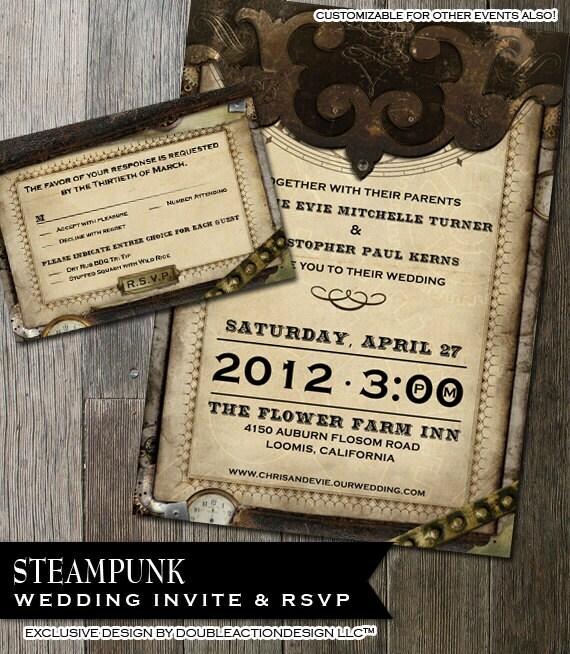 Steampunk Wedding Stationary -RSVP-Invitation-Thank You-Save the Date-- with multiple gears on distressed parchment paper faux background. Absolutely beautiful!! Got the proofs much quicker than expected and the final product PDF soon after! Love how the invitations turned out and will be recommending OddLotPaperie 100%!!! Julie is amazing to work with, crafting our perfect invitation. Before I knew it, It was done!! Cancellations are accepted within the FIRST HOUR after purchase. After that we offer to hold your order, or you can choose something from our shop in lieu of your order, like thank you downloads or game downloads. If you have left your order in our store for over a month without any contact with us, we will close it out and send you an editable PDF of your order so you can customize yourself. Please be sure you need your order before you purchase, check your shopping cart etc. All sales are final due to the personalized nature of the shop. Custom orders b/c they included specialized design work that you ask for for and designers time to to create, we do NOT refund those. We do not copy designs of others as well. How do I print these, do you offer printing? We do offer professional printing, contact me for quotes. We cover most cost of shipping on our print orders (everything must be shipped together) Separate item shipments will be billed accordingly for extra shipping charges. Choose "digital file only" if you'd like to print your invitations yourself. • Include your event info in the "note to seller" during checkout. Will you do a mockup before i purchase so I can see my invite? We do NOT provide mock-ups or customized samples prior to purchase. All work is started only after a purchase is made. I approved the design but the wording is wrong, can I get a refund? Please look over your proofs thoroughly. We will fix any wording on your order up until you approve and we send finals. As it is your job to look over and make sure we have done everything to your satisfaction and everything is correct. Once approved it is your digital signature that everything is exactly as you want it and you are ready for finals and to close your order. You are ultimately responsible for making sure everything is 100% correct and to your satisfaction. Refunds are not issued if you have approved your order. Can I order a print sample? We do offer print samples. These are for checking paper and ink quality. You an order a sample for 6.95 via the listing dropdown or on our main page under add-ons. Samples are not customized. Odd Lot reserves the right to reproduce custom made items. We also reserve the right to photograph all items we create and may use them at our discretion for advertising or as samples inside our listings. All photos of completed work are the property of Odd Lot and cannot be used without our permission. Why choose Odd Lot when there are a sea of design studios? Started with passion and customer service, Odd Lot Paperie has been Etsy since 2008 - we really are passionate about designing for YOU! We LIVE AND BREATHE DESIGN! We are professionals who love what we create and get involved with each and every customer, as we care about you even after the sale. We love what we create and want you to love what we design for you! We pride ourselves on our design style and originality & providing a gorgeous, original, high end product at a reasonable price. Our original designs and exceptional customer service stand out because we care. • Odd Lot Paperie is design-centric at our core. We LOVE design! No refunds will be accepted due to the nature and personalization of the product. We work with you to design a custom piece for you based off your examples. We do not copy others artwork. Cost if for designers time spent on designing for you, not the design itself.